A long white stripe of fur parts the skunk's black mass of hair from head to tail. Its beautiful coat and diminutive size makes the animal appear harmless, but one whiff of its foul smelling spray should easily change such thoughts. 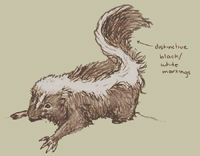 Skunks can spray players, stunning them and causing them to stink for a period of time. This page was last modified on 14 July 2015, at 21:22.